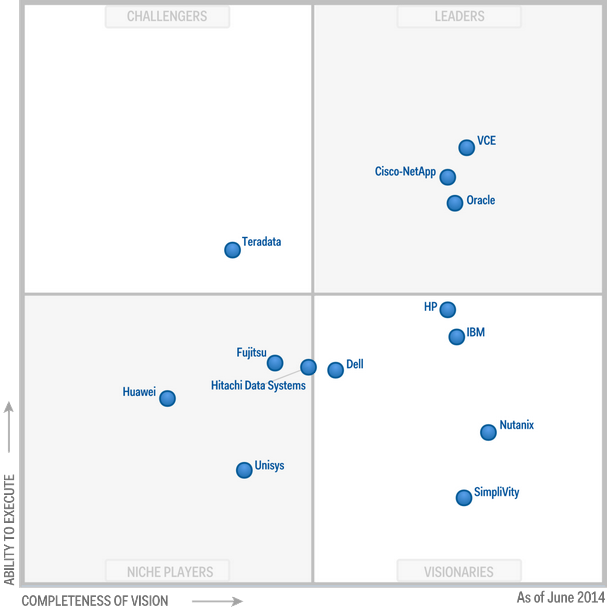 #Nutanix is the Visionary leader in #Gartner magic quadrant! – #IaaS, #PaaS, #DaaS, #Storage, #Converged | The IT Melting Pot! I’m not surprised at all and think that this is a good report by Gartner! Nutanix is absolutely the visionary leader and once more and more units are shipped they will also climb higher into the leaders section and totally rule! I must say that this is a really impressive product that truly is web-scale ready for SMB to large enterprise workloads!! Contact us at EnvokeIT if you need more details! We know the product and how it can deliver value to you! Nutanix has close working relationships with multiple top software vendors, and workloads like VDI, Hadoop and DBMS servers are well-represented among the installed base. Maximum neutrality is a major focus for Nutanix, as it works to build trust across a wide variety of vendors. The vendor frequently targets specific workload needs to penetrate new accounts, and then expands the workload reach to compete with incumbent vendors as client confidence is built. Nutanix claims that 50% of first-time clients expand their configurations within six months (and 70% do so within 12 months). Integrated stack systems (ISS) — Server, storage and network hardware integrated with application software to provide appliance or appliancelike functionality. Examples include Oracle Exadata Database Machine, IBM PureApplication System and Teradata. Integrated infrastructure systems (IIS) — Server, storage and network hardware integrated to provide shared compute infrastructure. Examples include VCE Vblock, HP ConvergedSystem and IBM PureFlex System. Integrated reference architectures — Products in which a predefined, presized set of components are designated as options for an integrated system whereby the user and/or channel can make configuration choices between the predefined options. These may be based on an IIS or ISS (with additional software, or services to facilitate easier deployment). Other forms of reference architecture, such as EMC VSPEX, allow vendors to group separate server, storage and network elements from a menu of eligible options to create an integrated system experience. Most reference architectures are, therefore, based on a partnership between hardware and software vendors, or between multiple hardware vendors. However, reference architectures that support a variety of hardware ingredients are more difficult to assess versus packaged integrated systems, which is why they are not evaluated by this research. Fabric-based computing (FBC) — A form of integrated system in which the overall platform is aggregated from separate (or disaggregated) building-block modules connected over a fabric or switched backplane. Unlike the majority of IIS and ISS solutions, which group and package existing technology elements in a fabric-enabled environment, the technology ingredients of an FBC solution will be designed solely around the fabric implementation model. So all FBCs are an example of either an IIS or an ISS; but most IIS and ISS solutions available today would not yet be eligible to be counted as an FBC. Examples include SimpliVity, Nutanix and HP Moonshot System. Read the whole Gartner Magic Quadrant for Integrated Systems here!